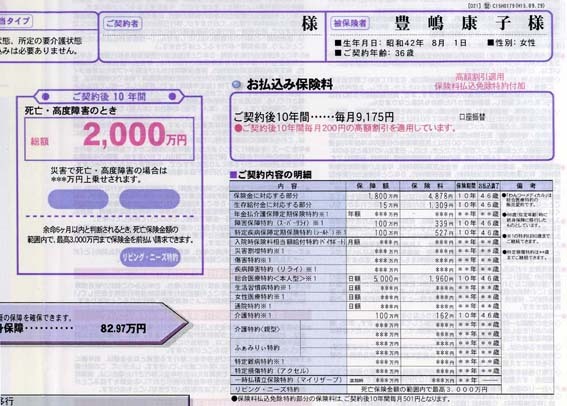 Action: I have been paying monthly toward the life insurance an amount of ¥9,175 since 2003 and will continue to pay until 2013. Life Design illustrates how a fixed amount could frame the projection into an unknown but inevitable event in the future. The monthly payment is a stipulated amount and the period of time when payments are to be made are both quantifiable even as circumstances around the event of my death cannot be absolutely predicted. This work demonstrates the application of predetermined actuarial mathematics on a life and its more indeterminate existential dimension, a way of computing an ascertainable formula within a system/reality fraught with variabilities and uncertainties. Copyright © 2011 TOYOSHIMA Yasuko. All rights reserved.